The streets of Mega-City One are a dark and violent place. In the 22nd Century the rules of society have broken down and a new order has arisen to take control. Enter the Judges, empowered to apprehend miscreants and sentence them on the spot. In a hard world, the Judges have to be harder still. It may be a brutal system but it is the only thing that works. What you hold in your hands is a collection of lore related to the Justice Department and the citizens it protects - often from themselves. These volumes will detail the world of the Judges as never before. 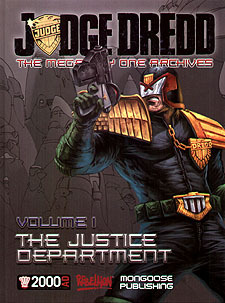 If it drives, shoots, breathes, sprawls or hides in the shadows of Mega-City One, you will find it in this comprehensive collection. This volume takes you on a guided tour of the only power great enough to keep the peace in a world gone mad. Within these pages, the training of new Judges is described, luminaries and notable members are discussed and the procedures that maintain effectiveness and discipline are revealed. This book covers the Justice Department from Sector Houses to sequestered archives, from the mechanical miracles of Tek-Div to the world-shaping decisions of the Council of Five and the Chief Judge. Here are the halls of power. Here is where rules are made. Here is the Law!